For other uses, see Noodle (disambiguation). Noodles are unleavened dough which is stretched, extruded, or rolled flat and cut into one of a variety of shapes which usually include long, thin strips, or waves, helices, tubes, strings, or shells, or folded over, or cut into other shapes. Noodles are usually cooked in boiling water, sometimes with cooking oil or salt added. They are often pan-fried or deep-fried. Noodles can be served with an accompanying sauce or in a soup. Noodles can be refrigerated for short-term storage or dried and stored for future use. The material composition or geocultural origin must be specified when discussing noodles. Noodles are a staple food in many cultures. The word derives from the late 18th century German word Nudel. Jan Vermeer van Utrecht's painting of a man eating noodles (National Museum, Warsaw). The origin of noodles is Chinese, and the earliest written record of noodles is found in a book dated to the Eastern Han period (25–220). Noodles were often made from wheat dough. It became a staple food for the people of the Han dynasty (206 BCE – 220 CE). A Nature article claimed the oldest evidence of noodle consumption was from 4,000 years ago in China. In 2005, a team of archaeologists reported finding an earthenware bowl that contained 4000-year-old noodles at the Lajia archaeological site. These noodle were said to resemble lamian, which are a type of Chinese noodle that is made by repeatedly pulling and stretching the dough by hand. Analyzing the husk phytoliths and starch grains present in the sediment associated with the noodles, it was determined that the noodles were made from millet, identified as belonging to Panicum miliaceum and Setaria italica specifically. However, looking at the production process of making noodles from millet, other researchers determined that it is not feasible to stretch millet dough into noodles, concluding that the analyzed husk phytoliths and starch grains did not originate from the noodles that were found. They also criticized the sampling method (as the samples found in the sediment may not represent the composition of the noodles), the morphological observations of the starch granule samples (as it is contradictory to the preparation of noodles in traditional Chinese cooking), and the exclusion of wheat and barley as components (as morphological changes during the cooking process causes difficulty in observation, and the cultivation of wheat and barley has a long history in the Yellow River basin). It has also been noted that millet dough cannot be hand-pulled into noodles, as the absence of gluten in millet causes the dough to be not elastic and thus not malleable. Wheat noodles in Japan (udon) were adapted from a Chinese recipe by a Buddhist monk as early as the 9th century. Reshteh noodles were eaten by the people of Persia by the 13th century. Innovations continued, as for example, noodles made from buckwheat (naengmyeon) were developed in the Joseon Dynasty of Korea (1392–1897). Ramen noodles, based on Chinese noodles, became popular in Japan by 1900. In the 1st century BCE, Horace wrote of fried sheets of dough called lagana. However, the method of cooking these sheets of dough, lagana, does not correspond to the current definition of either a fresh or dry pasta product, which only had similar basic ingredients and perhaps the shape. In the 2nd century CE, the Greek physician Galen mentioned itrion, referring to all homogenous mixtures from flour and water. The Latinized itrium was used as a reference to a kind of boiled dough. The Jerusalem Talmud records that itrium was common in Israel from the 3rd to 5th centuries CE. Arabs adapted noodles for long journeys in the fifth century, the first written record of dry pasta. The ninth-century Arab physician Isho bar Ali defines itriyya, the Arabic cognate of the Greek word, as string-like shapes made of semolina and dried before cooking. Muhammad al-Idrisi wrote in 1154 that itriyya was manufactured and exported from Norman Sicily. Itriya was also known by the Aramaic speakers under the Persian sphere and during the Islamic rule referred to a small soup noodle prepared by twisting bits of kneaded dough into shape. The first concrete information on pasta products in Italy dates to the 13th or 14th centuries. Pasta has taken on a variety of shapes, often based on regional specializations. Since at least the 20th century, pasta has become a staple in North America and elsewhere. In the area that would become Germany, written mention of Spätzle has been found in documents dating from 1725, although medieval illustrations are believed to place this noodle at an even earlier date. Zacierki is a type of noodle found in Polish cuisine. It was part of the rations distributed in the Łódź Ghetto in German-occupied Poland. (Out of the "major ghettos", Łódź was the most affected by hunger, starvation and malnutrition-related deaths.) The diary of a young girl from Łódź recounts a fight she had with her father over a spoonful of zacierki taken from the family's meager supply of 200 grams. For varieties of Italian semolina pasta, see List of pasta. Bakmi: Indonesian Chinese yellow wheat noodles with egg and meat, usually pork. The Chinese word bak (肉), which means "meat" (or more specifically pork), is the vernacular pronunciation in Hokkien, but not in Teochew (which pronounced it as nek), suggesting an original Hokkien root. Mi derives from miàn.In Chinese, miàn (simplified Chinese: 面; traditional Chinese: 麵; often transliterated as "mien" or "mein" ) refers to noodles made from wheat. 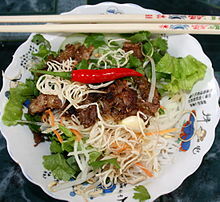 Bánh phở, Vietnamese name of the Chinese rice noodles ho fun 河粉 . Acorn noodles, also known as dotori guksu (도토리국수) in Korean, are made of acorn meal, wheat flour, wheat germ, and salt. Olchaeng-chi guksu, meaning tadpole noodles, are made of corn soup put through a noodle maker right into cold water. It was named for its features. These Korean noodles are mostly eaten in Gangwon-do. 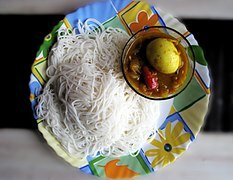 Cellophane noodles are made from mung bean. These can also be made from potato starch, canna starch or various starches of the same genre. Baked noodles: Boiled and drained noodles are combined with other ingredients and baked. Popular examples include lasagne and many casseroles. Basic noodles: These are cooked in water or broth, then drained. 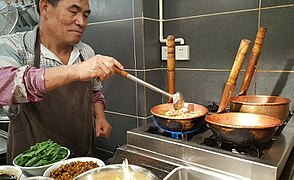 Other foods can be added or the noodles are added to other foods (see fried noodles) or the noodles can be served plain with a dipping sauce or oil to be added at the table. In general, noodles are soft and absorb flavors. Chilled noodles: noodles that are served cold, sometimes in a salad. Examples include Thai glass noodle salad and cold udon. Fried noodles: dishes made of noodles stir fried with various meats, seafood, vegetables, and dairy products. Typical examples include chow mein, lo mein, mie goreng, hokkien mee, some varieties of pancit, yakisoba, Curry Noodles, and pad thai. Noodle soup: noodles served in broth. Examples are phở, beef noodle soup, chicken noodle soup, ramen, laksa, saimin, and batchoy. ^ Harper, Douglas. "noodle". Online Etymology Dictionary. Retrieved 14 October 2009. ^ "The History of Noodles: How a Simple Food Became a Worldwide Staple". The Atlantic. ^ "A short history of Japan's long noodles". The Japan Times. ^ Serventi & Sabban 2002, p. xi. "[...] He was referring to Italian pasta, but the observation can safely be generalized to include all pasta, a food that originated in China and from there spread to Japan, Korea, most of Southeast Asia, and the rest of the world." ^ a b Roach, John (12 October 2005). "4,000-Year-Old Noodles Found in China". National Geographic. pp. 1–2. ^ Sinclair & Sinclair 2010, p. 91. ^ a b c Lu, Houyuan; Yang, Xiaoyan; Ye, Maolin; et al. (13 October 2005). "Culinary archaeology: Millet noodles in Late Neolithic China". Nature. 437 (7061): 967. doi:10.1038/437967a. PMID 16222289. ^ a b Ge, W.; Liu, L.; Chen, X.; Jin, Z. (2011). "Can noodles be made from millet? An experimental investigation of noodle manufacture together with starch grain analyses". Archaeometry. 53: 194–204. doi:10.1111/j.1475-4754.2010.00539.x. ^ Sabban, Francoise (17 October 2012). "A scientific controversy in China over the origins of noodles". Open Edition. Retrieved 25 November 2015. ^ Serventi & Sabban 2002, pp. 15–16 & 24. ^ Serventi & Sabban 2002, pp. 15–16. ^ a b Serventi & Sabban 2002, p. 17. ^ Serventi & Sabban 2002, p. 29. ^ "A medical text in Arabic written by a Jewish doctor living in Tunisia in the early 900s" (Dickie 2008: 21). ^ Rodinson, Perry & Arberry 2001, p. 253. ^ Serventi & Sabban 2002, p. 10. ^ "City Profile: Stuttgart" (PDF). London: Embassy of Germany, London. Retrieved 26 November 2015. Spätzle is a city specialty. ^ Strybel, Robert; Strybel, Maria (2005). Polish Heritage Cookery. Hippocrene Books. ISBN 978-0-7818-1124-8. ^ Zapruder, Alexandra (2015). Salvaged Pages: Young Writers' Diaries of the Holocaust. Yale University Press. p. 226-242. ISBN 978-0-300-20599-2. ^ Heberer, Patricia (2011-05-31). Children during the Holocaust. Rowman Altamira. ISBN 978-0-7591-1986-4. Dickie, John (1 October 2010). Delizia! The Epic History of Italians and Their Food (Paper). New York: Atria Books. ISBN 0743278070. Errington, Frederick et al. eds. The Noodle Narratives: The Global Rise of an Industrial Food into the Twenty-First Century (U. of California Press; 2013) 216 pages; studies three markets for instant noodles: Japan, the United States, and Papua New Guinea. Rodinson, Maxime; Perry, Charles; Arberry, Arthur J. (2001). Medieval Arab Cookery (Hardback). United Kingdom: Prospect Books. p. 253. ISBN 0907325912. Sinclair, Thomas R.; Sinclair, Carol Janas (2010). Bread, beer, and the seeds of change: Agriculture's imprint on world history. Wallingford: CABI. p. 91. ISBN 978-1-84593-704-1.